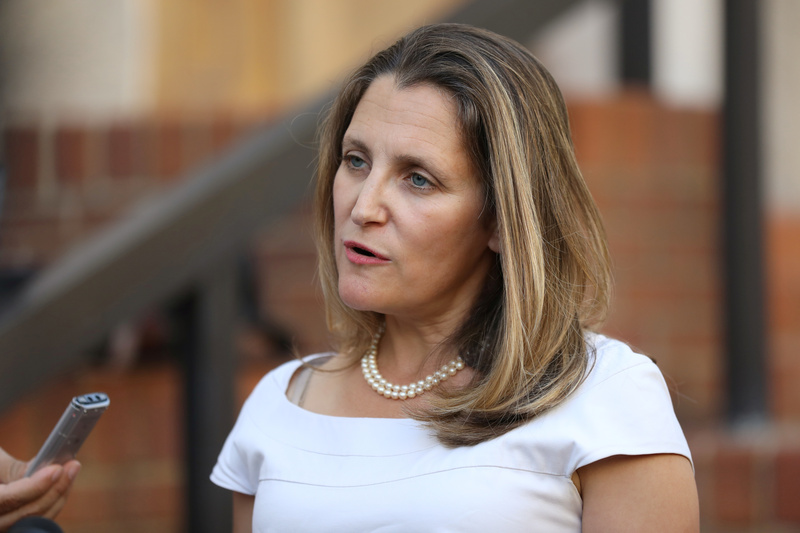 Candian Foreign Minister Chrystia Freeland speaks to journalists outside the U.S. Trade Representative's office in Washington, U.S., August 28, 2018. Canada’s Foreign Minister Chrystia Freeland said on Aug. 29 that she was optimistic about having productive talks with the United States to renegotiate the North American Free Trade Agreement. Canada rejoined the talks on Aug. 28 after Mexico and the United States held bilateral discussions for about five weeks. On Aug. 27, the United States announced a deal with Mexico on certain NAFTA provisions, such as increasing the amount of regional auto content needed to qualify for tariff-free trade from 62.5 percent to 75 percent. U.S. President Donald Trump threatened to impose auto tariffs of up to 25 percent on Canada if it didn’t agree to a NAFTA deal by Aug. 31. U.S. and Mexican officials set that deadline because of the 90-day notice period the U.S. Congress needs for an impending trade deal. Submitting the details to Congress after the end of the month would mean the revised agreement would not be finalized before the end of Mexican President Enrique Peña Nieto’s term in office. The parties hope to have the pact signed before his successor, Andrés Manuel López Obrador, takes over on Dec. 1.